Keysight U2531A Simultaneous sampling DAQ, 4-CH differential analog input; 2MS/s. Home USB modules USB Data acquisition Keysight U2531A Simultaneous sampling DAQ, 4-CH differential analog input; 2MS/s. The U2531A offers multifunction capabilities in a module. It can be used like a digital multimeter in polling mode. It can be transformed to be a simple scope using the continuous mode with simple triggering capabilities. No matter if it is used as a standalone module or when plugged into a U2781A USB modular instrument chassis, the synchronization and triggering capabilities allow great flexibility in making the desired measurements. With the analog output being able to send out predefined or arbitrary waveforms make this a good tool when closed loop feedback or stimulus is required. The digital IO channels allows for closed loop control through connections to switches, relays and solenoids. The burst mode enables the U2531A to simulate simultaneous analog input acquisition. The U2531A works together with an optional U2901A or U2902A terminal block for easy connections. It comes bundled with the Keysight Measurement Manager (AMM) software for quick set up and data logging. Simplifying this further is the command logger function offered in the Keysight Measurement Manager that allows capturing of configuration commands that can be easily converted to snippets of VEE code. Other supported languages are VB, C++, and C#. Giving users more flexibility, the U2531A is compatible with a wide range of application development environments such as Keysight VEE, MATLAB® R2007a, NI LabVIEW and Microsoft® Visual Studio®. The U2531A is ideal for applications that require high sampling rates per channel such as transient signal analysis or simultaneous acquisition of data for phase sensitive applications. Visual Studio, Microsoft and Windows are registered trademarks of Microsoft Corporation in the United States and/or other countries. MATLAB is a U.S. registered trademark of The Math Works, Inc. Videos and downloads Keysight U2531A Simultaneous sampling DAQ, 4-CH differential analog input; 2MS/s. Accessories Keysight U2531A Simultaneous sampling DAQ, 4-CH differential analog input; 2MS/s. 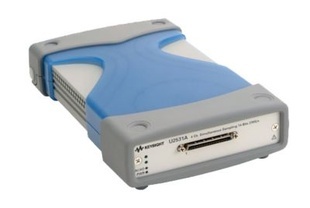 Related product to Keysight U2531A Simultaneous sampling DAQ, 4-CH differential analog input; 2MS/s.